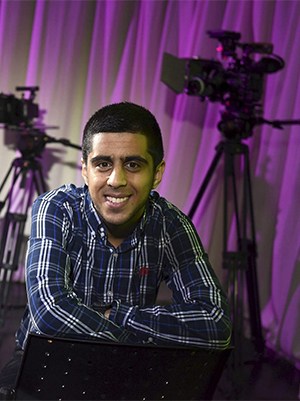 Qasim loved seeing films come to life from script to screen. I decided to study at Teesside after visiting on an Open Day. It’s close to home and I loved the facilities available for my subject. I enjoyed the practical side of the degree most, going out into the real world working and negotiating with real people and working in teams and the challenges that brings. I also enjoyed the process of making films – seeing the progression from script to screen was incredible. Seeing something you've worked on for months on end, day and night, finally on the big screen during our final year screenings felt like a brilliant achievement. How has your time at university helped prepare you for your future career? The course really helped to prepare me for my career path. I spent much of my final year on placement with the University’s Department of External Relations. During that time I was creating bespoke digital content for the University’s social media platforms, reaching thousands of people and engaging with students. Is there anything else you would like to say about your time here? My experience at Teesside University has been the best it could be. I’ve met new people, made friends for life and had great support from peers and lecturers. Coming here was the best decision I made and I guarantee it will put you on the right path towards achieving your dreams. It has given me a wealth of contacts and experience and I look forward to seeing what the future holds.